Who doesn’t love a mystery?? Good, now maybe y’all can help me solve one. 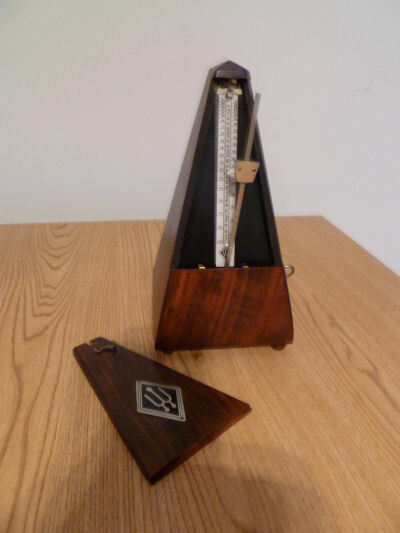 We have a metronome on the piano. It’s been there since I was little and was used extensively to help me keep a steady rhythm as I practiced. I rather hated it. Not the metronome so much, but the incessant repetition of scales, one after another. As you can see, it’s OLD. Way before the time of digital, electronic, quartz metronomes. Or free metronome apps. But it still works. It was made in Germany and features a pendulum that you set to a precise number of beats per minute; the clicking sound still makes me nervous. 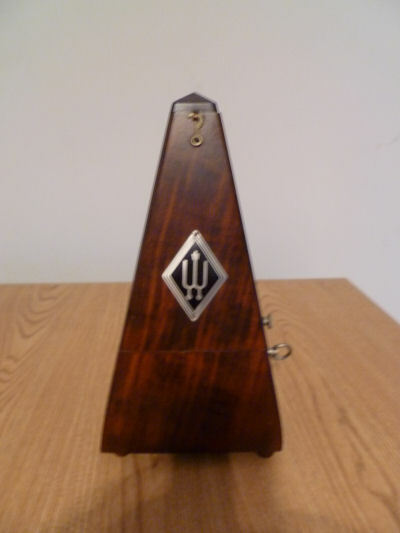 The other morning, I went into the living room and found the faceplate lying on the carpet, a good six feet away from the metronome itself (which, as I already mentioned, was sitting on top of the upright piano — not a short spinet, but one as tall as the strings in a baby grand). The question is, How did it get there?? You’ll notice the faceplate has a latch on top and because it’s old, you have to work to get it unhinged. Additionally, the faceplate has a grooved lip that slides into the base before you can latch it. So it’s a two-step process — lip in bottom, latch on top. I was the last person in the living room. I went in about nine o’clock to fill some bald spots in the Christmas tree with more decorations. The faceplate wasn’t on the carpet then. Darling Dallas sleeps in my room, and I had my door shut. He’s never learned how to open a shut door, nor has he ever learned how to climb on the piano bench and operate the metronome. All the exterior doors were shut and locked, as they were the next morning. This entry was posted in Uncategorized and tagged faceplate, mechanical metronome, metronome, music lessons, piano, solve a mystery. Bookmark the permalink. A friend decided to play a prank on you by sneaking in and removing the face plate because she knew it would drive you nuts? I don’t know- that’s strange! This kind of reminds me of something that happened when I was a kid. My parents left my brother and I at home alone. When they got home, they called me into the room and asked who broke the lamp. ‘What lamp?’ I’d asked. Annoyed, they pointed to one of their ugly 1970s amber globe lamps that had come apart (the glass was still in tact though.) I told them I didn’t know- I didn’t even know it was broken. Well, then they called my brother out of his room and asked him the same question. I cringed when he said, “What lamp?” just as confused as I was. Well, they got mad at our ‘playing dumb’ and we both got in trouble for breaking the lamp. To this day, we both swear we had nothing to do with it! Your parents were probably miffed at the thought of you and your brother “collaborating,” Janna! How odd that the lamp didn’t break and you never found out what happened to it. I imagine I’ll never find out the answer to my mystery either. Thanks for trying, though I’m pretty sure nobody could have gotten in without our knowing it! Oh my…I’m not sure at all…maybe it just popped off? You sound JUST like Domer when I told him about it! Funny, but I’d have thought you two could have come up with something more whimsical. Why would a faceplate suddenly pop off after sitting in basically the same position for years?? Absolutely NOT! *gasps, horrified* Dallas would herd them into a corner and play with them until they died, you know. A ghost? That likes music but couldn’t quite figure out the metronome? I’m sure it was an accident. I thought about a ghost, Katybeth. Maybe it was trying to encourage me to return to the piano?? Ha ha, I was going to guess a ghost, too! Did you question Dallas? Actually, I did, Suzi. He sniffed at the faceplate for a while, then, finding that it wasn’t edible, turned his attention elsewhere. No help from a hungry dog!! Christmas angels were playing too many carols and got a little wonky with the metronome plate???? But it was done in a spirit of love and they left it so you’d have a hunch they’d been there. I like the idea of Christmas angels! Much better to have angels floating around than zombies or ghosts, don’t you agree?? Debbie, I’m completely dumbfounded about this because I thought and thought about it but can’t come up with HOW that could have happened, other than the latch not being totally fastened, thus the faceplate flew off. It is a puzzle, Ron. What’s baffling is that, to my knowledge, it’s never just flown off before, and I can’t see how — or why — it would do so now. As a writer, I have a vivid imagination. So I can totally get on board with an angel giving me a sign! Perhaps the angel is saying it’s TIME for me to finish my novel?!? Thanks for dropping by with your thoughts! I’d say vibration. Now, granted — I can’t tell you the source of the vibration, but I have seen instances of vibration doing really strange things. For example, on a sailboat, I’ve seen vibration literally separate a nut from its screw. Sometimes, the vibrations can be so faint we don’t notice them, but they’re there. Another, slightly different example. I have several crown molding ledges in the living room, with plates and oil lamps on them. Once a month I have to go around and shove everything back from the edge, because just opening and closing the door every day is enough to scootch them forward. That’s my theory — vibration unlatched the thing over time, and it finally opened up. Linda, I think you’ve hit on the right answer — it’s not anywhere near as “interesting” as my writer’s brain would like, but logically, it makes sense. This morning, I heard a bizarre rattling sound that I finally identified as a sun catcher hanging in my window and gently swinging to and fro. Shortly afterward, I heard the distinctive sound of a train rolling down the tracks that are probably a half-mile away. So yes, it seems that the rumbling of a train COULD dislodge the faceplate and send it careening through the air!! How bizarre! I sure hope that you are going to enlighten us in your next post. I wish I could, Pat, but I don’t have an answer. Domer insists it’s all purely logical and scientific (and maybe it is!). My writer’s imagination kind of balks at something like that, of course, because I’d prefer a more whimsical solution. Not zombies, though, ha!